Today was a rainy, hazy, bad-hair-day, so I stayed in and indulged myself. A month ago I had started cutting a dummy for a new winter jacket. I have some lovely soft black wool from an older project left over, and I am designing and sewing a wool-and-leather jacket for myself. I won’t be able to wear it until fall, but with my old jacket worn to loving shreds I need a fresher-looking example of my tailoring. I’m developing it from an older set of blocks I had done for myself. It’s funny how my ideas about drafting change so much in such a short time. I just finished sewing up the dummy. The shaping in the back needs to be adjusted a bit for my sway back. 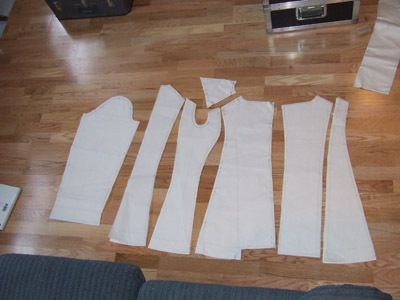 The neckline is a bit too tight and needs to be cut back. The collar needs a new shape. The sleeves worked out surprisingly well but need to be tweaked forward just a touch, and the armhole need a tweak too. In a new jacket, there’s always a million little things to pay attention to. That’s why making a dummy is so smart.